To study the importance of ecological interactions in the ecosystem. To study the relationship between prey and predators in the ecosystem and to understand the basic concept of Prey-Predator cycle using Lotka-Volterra Equations. Ecology is a branch of science that deals with the study of distribution and abundance of organisms in the ecosystem, and their interactions with the environments. The environments include both abiotic (physical) and biotic (biological) factors. The physical factors may be divided into those which plants and animals use as resources, such as the nutrients in the soil, CO2, water and the critical factors for their survival such as temperature, wind, pH and osmotic balances. The physical environment commonly limits population abundance of plants and animals, as well as their geographic distributions. It can also change the species composition that occurs in the ecosystem. On the other hand, biotic ecosystem includes organisms, organic molecules, and cells and is a most diverse and easily changeable part of ecosystems. Since all living things in an ecosystem are interdependent, the associations existing between the different organisms in the ecosystem influences the survival of organisms and the functioning of the ecosystem as a whole. Hence to understand the overall dynamics of the ecosystem, it is important to consider the impact of both environmental variations and multispecies interactions, which will have both ecological and evolutionary effects. Some of the ecological interactions are mutually beneficial, or mutually detrimental or neutral. The process competition is thought to be a part of daily life. Competition is a relationship in which different organisms or populations in the ecosystem attempt to use the same limited resources at the same time. The limiting resource may be water, prey, light, water etc, which is responsible for the organism’s growth and survival in the ecosystem. Competition can occur both within (intra specific) and between (inter specific) species. An individual experiences both types of competition, but the range of the competitions varies widely from population to population and species to species. Competition among the individuals can also be characterized as resource competition or interference competition. The resource competition is characterized by the organism’s completion directly for the limiting nutrient in the ecosystem, there by obtaining as much each individual can. An example is the competition of fly maggots in a mouse carcass, where few individuals obtain enough nutrients for their reproduction and survival. Resource competition may not always cause the exclusion of one species instead some species can coexist, with a marked reduction in their growth potential capabilities. In interference competition, the individuals harm each other directly by a physical force. In this case either the individuals interact with foraging, survival, and reproduction of others or directly prevent their physical organization in a part of their habitat. An example is the physical intimidates of caterpillar to other. Interference competition generally results in the exclusion of one of the two competitors. Early in the 20th Century, A.J. Lotka and V. Volterra developed a model for population growth, which explains that two species cannot compete for the same limiting resource for a long period. This is known as Competitive exclusion principle. G.F.Gausse, a Russian ecologist, demonstrated that Paramecium aurellia competes and later displaces Paramecium caudatum which apparently confirmed the Competitive exclusion theory. Recent studies showed the coexistence of some killer particle in Gausse’s strain P. aurellia is responsible for such an outcome. Later Thomas Park showed that due to interference competition, the confused flour beetle and the red flower beetle would not coexist and hence one species always excluded the other. An organism which feeds on another organism for their food is called predator while the organism that is fed upon is termed as the prey. This kind of interaction between the prey and predator is known as predation. Typically a predator tends to be larger than that of the prey, and hence they consume many preys during their life cycle. 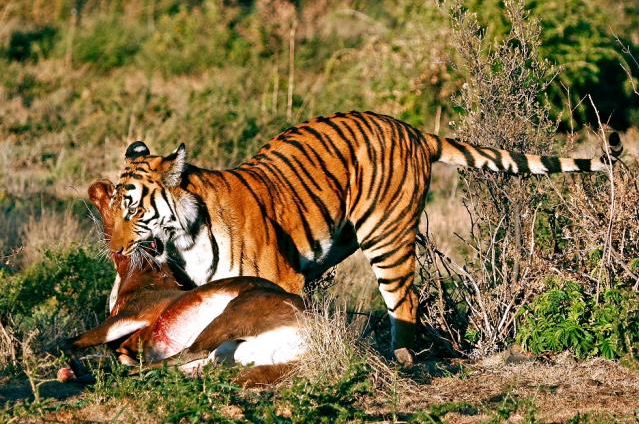 During the act of predation often the death of prey will occur due to the absorption of the prey’s tissue by the predator (Figure 1). Typical examples of predation are bats eating the insects, snakes eating mice, and the whales eating the krill. In the case of some complex food webs, a predator can also become a prey for the species. Most of the organisms in the ecosystem evolved some kind of defense mechanisms against the predations. This is a blending phenomenon of an organism with the background color of its habitat is a common method of avoiding detection by their predators in the ecosystem. 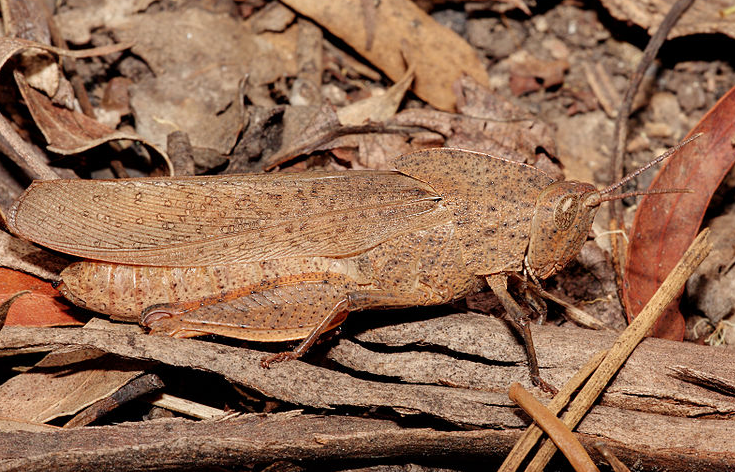 An example is grasshoppers which can blend perfectly with the materials on which they feed. The veins of leaves are often mimicked on the grasshopper’s wings (Figure 2). Besides camouflage, some organisms mimic other animals, for example, some hoverflies mimic wasps in the ecosystem. The similarities between one species to another protect one or both the species involved in the mimicking process. The similarities can be either in their appearance, behavior, sound, movement or location and which helps them protect themselves from the predators. Commensalism is an interspecific relationship between two organisms in the ecosystem where one species benefits while the other species remains unaffected (Figure 3). In this association, usually a commensal can obtain nutrients from the host species for their shelter, growth, and locomotion. The host remains unaffected. The host is larger and unmodified, while the commensal is smaller with some modified structural adaptations with its habitats. 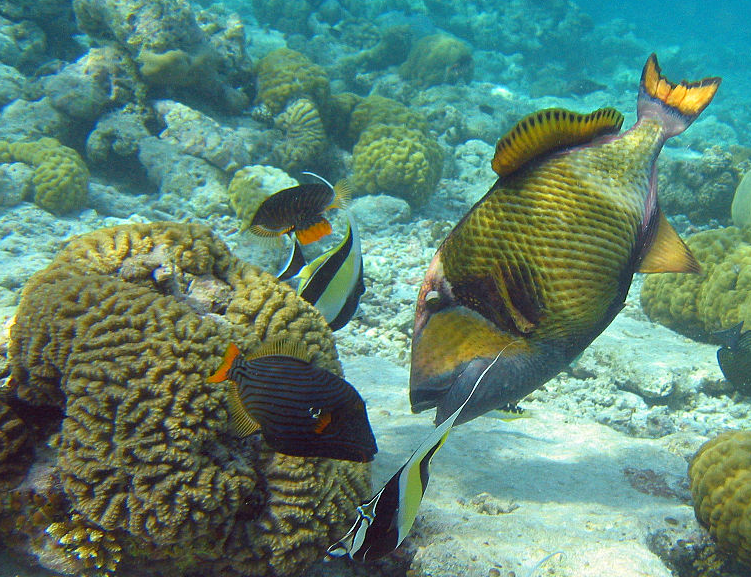 Figure 3: Titan triggerfish helps the smaller fish by moving large rocks too big for them to shift themselves. Unlike commensalism, mutualism is an interspecific interaction between two organisms in the ecosystem with benefit to both the associating members in the interaction. During this interaction, populations of each interacting species grow survive and reproduce at a higher rate in the presence of the other interacting species. 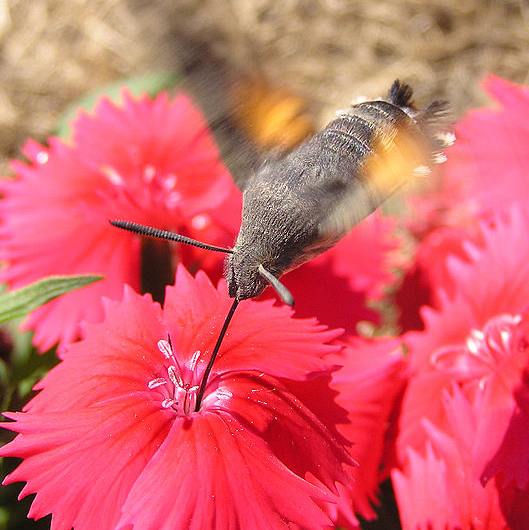 Pollination is a good example to explain mutualism, where the plant gets benefit from the dispersal of pollen the pollinator obtaining a meal of nectar from the flower (Figure 4). 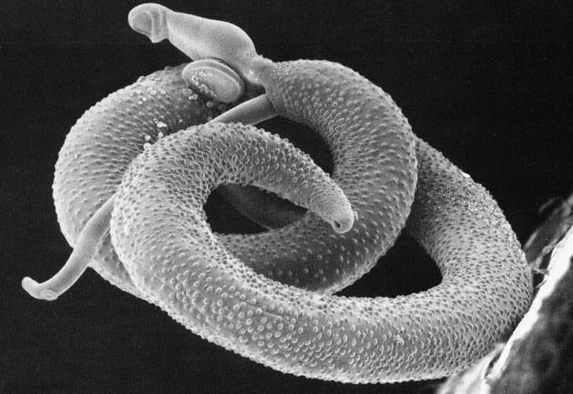 A parasite feeds on the host, but they generally do not destroy it. Parasites are usually smaller then the host. Parasites may have more than one host during its life cycle. The host evolved some defense mechanisms against the parasites; the most important is the immune responses such as cellular defenses. Also parasites can substantially decrease the host population sizes. The relationship between the parasites and the hosts is known as Parasitism. Tapeworms, blood sucking leeches and tape worms are typical examples of parasites (Figure 5). The predator-prey relationship is substantial in maintaining the equilibrium between various animal species. Without predators, certain species of prey would force other species to extinction as a result of competition. We can explain the critical effects that can be caused by an imbalance in the Predator-Prey relationship. We will consider a predator-prey population where Foxes hunt Rabbits. Imagine a situation where, due to increase in Illegal Poaching, the number of Fox drastically falls down. Those that survive may fear coming out during day time and may decide to go in search of food during the night when they are at a serious disadvantage, as evolution has not favored them to have the skills of poaching nocturnal. They won't survive in such conditions. The population of Rabbit starts to spike at that area, thus leading to competition for existing food sources. Since most are likely to starve, they go in search of alternate food sources. They start exploring beyond their usual boundaries, they step foot into the World Dominated by Primates!! They learn quickly that, there is easy and direct access to food at our farms and agricultural fields. Gradually the numbers depending on our agriculture shoots up. Our crops get destroyed, chances of Zoonosis increases, etc. They can affect our Economy, Health and Hygiene, Food supply, etc. Many studies on the population ecology of predators have demonstrated that predator numbers rise-and-fall cyclically with those of their preferred prey - albeit that there is a synchronicity between the populations. This scenario -- where the predator populations crash shortly after their prey populations experience a crash; this is known as predator-prey cycle. Logic and mathematical theory propose that when the prey population is abundant, their predator count will increase, consequently the prey population will decrease, which in turn accounts predator count to decline. The prey population eventually restores, starting a new cycle. 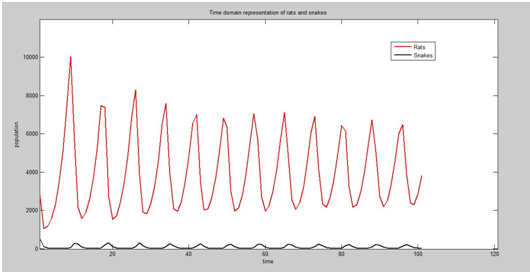 The population dynamics of predator-prey interactions can be modeled using the Lotka−Volterra equations, which is based on differential equations. These provide a mathematical model for the cycling of predator and prey populations. The mass action approach to modeling tropic interactions was pioneered, independently, by the American biophysicist Alfred James Lotka (1925) and Italian mathematician Vito Volterra (1926). These authors argued that consumer (predator) and resource (prey) populations could be treated like particles interacting in a homogeneously mixed gas or liquid and under these conditions, the rate of encounter between consumers and resources (the reaction rate) would be proportional to the product of their masses (the "law of mass action"). a is natural growth rate of R in absence of S.
c is natural death rate of snakes in the absence of food R.
b is the death rate per encounter of R due to predation. e is the efficiency of turning predated R into S.
The model helps to predict a cyclic relationship between the predator prey population dynamics in the ecosystem. As the number of predators increases, gradually the consumption rate also increases leading to the decrease in the prey population (Figure 1). Obviously, the decrease in the prey population causes the decrease in the predator population. Thus the reduction in the consumption rate of predators results in the growth of the prey. The cycle continues again. MacLulich published some classical information about the lynx and snow shoe hare in 1937. 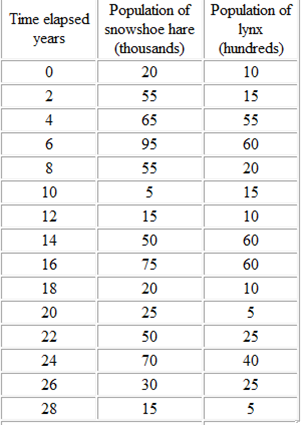 The population data was obtained from the records of lynx and snowshoe hare populations as evidenced by number of numbers of skin caught by trappers on 1845. 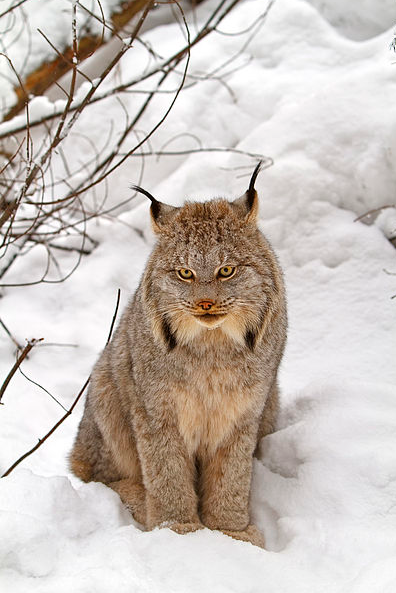 It is clear that snowshoe hare are the main prey of Canadian lynx, and there is no other predator involved significantly in this predation. 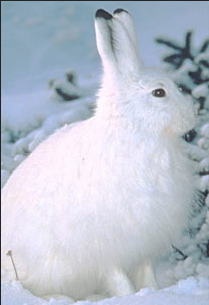 Since the hare is the major food item of the lynx, the two cycles are certainly related and thus an oscillation of interacting predator-prey populations is obvious in the case of snowshoe hare and lynx, where the period of oscillation is about 9.6 years (MacLulich 1937). The extent of direct and exclusively casual relationship existence is more difficult to determine. Destabilize community equilibrium: The enrichment of the system will result in an increase in the equilibrium density of the predator, but not in that of the prey. Lacks field observations for the prediction “situation of both a very low and a stable-prey equilibrium density is not possible in the prey-predator dynamics”.